The main reason for my visit to the Tate Modern at the end of October was the Tank is showing Suzanne Lacey’s Crystal Quilt. 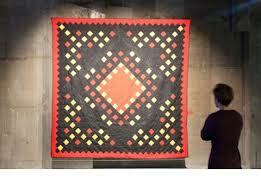 Suzanne Lacy’s The Crystal Quilt 1985–7 took place over three years in Minneapolis, Minnesota. A collaborative and public artwork, it explored how the media portrayed ageing and what the role for older people in public was. Incorporating many types of practice, from art exhibitions and lectures to community organising and a leadership seminar for older women, it culminated in a performance on Mother’s Day in 1987. 430 women aged over 60 from Minneapolis gathered together to perform in a live tableau, lasting an hour and broadcast live on a public television network. 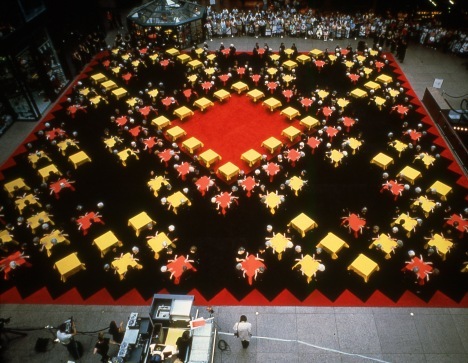 Staged on a series of tables laid out on a huge square rug (designed by the painter Miriam Schapiro), the performers sat four to a table, their hands laid on the coloured tablecloths changing at ten-minute intervals to echo the shapes of different quilt blocks (the quilt being an emblem of the traditional sharing of North American female experience). While the performers discussed their experiences and reminiscences, the audience also listened to a soundtrack by composer Susan Stone mixing the voices of 75 women talking about ageing – personal observations, their own memories, and sociological analysis of the unused potential of older people. In some sense The Crystal Quilt was successful politically, in that the work was bigger, it had more social impact in that region, but do one or two events ever change the way people – other than those who directly experience it – see? This raises this issue of whether you can expect art to create social change, and at what point is it no longer art. Susanne lacy’s work and writing have been very influential in the writing of my dissertation. I am still getting my head around social Interaction and Art. Seeing the video of the installation of the “Quilt” ((time-lapse video) and the real, physical quilt, which was designed by Miriam Shapiro and listing to the interview with Suzanne and the participants of “The Crystal Quilt” was very illuminating and touching.